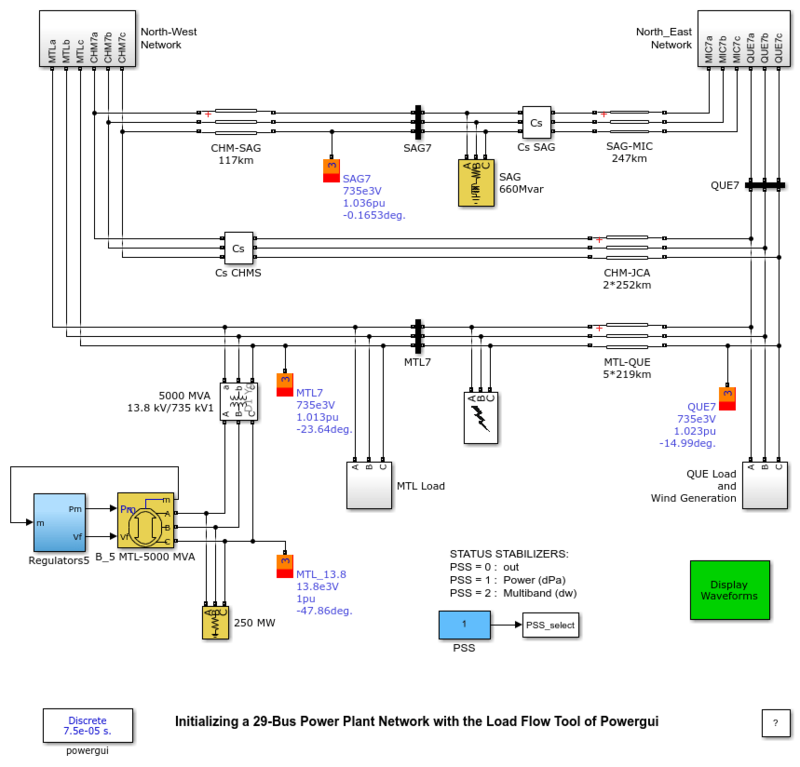 This example shows the use of the Load Flow tool of Powergui to initialize a 29-bus 735 kV network with detailed modeling of power plants using hydraulic turbines, speed regulation, excitation systems and power system stabilizers. The model shows a 735-kV transmission network with detailed modeling of seven 13.8 kV power plants (total available generation =26200 MVA) including hydraulic turbines, speed regulation, excitation systems and power system stabilizers. The 735-kV transmission network is both series and shunt compensated using fixed capacitors and inductors. The load is lumped at two buses (MTL7 and QUE7). The MTL Load subsystem connected to the MTL7 bus consists of four types of load blocks connected on the 25 kV distribution system through 735 kV /230 kV and 230 kV/ 25 kV transformers. The QUE Load and Wind Generation subsystem uses a 6000 MW load (constant Z and constant PQ) connected on the 120 kV bus. A 9 MW wind farm using an asynchronous generator is connected to the 120 kV bus through a 25-kV feeder and a 25 kV/120 KV transformer. The model is discretized using a 50 usec. sample time. A six-cycle three-phase fault is programmed at MTL7 bus. Look at waveforms in the scopes (inside the Display Waveforms green subsystem) and notice that simulation starts in steady state. In the Powergui menu, select 'Load Flow'. A new window appears. A summary of the load flow settings is displayed in a table. Press the 'Compute' button to solve the load flow. The table now displays the actual active and reactive powers of the load flow blocks of the model. Press the 'Apply' button to apply the load flow solution to the model in order to start the simulation in steady-state. 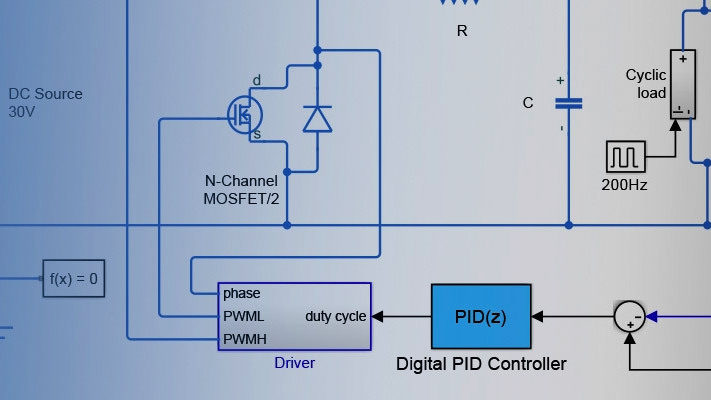 Note that the Load flow Bus block displays the bus voltage magnitude and phase angle as block annotations. Press the 'Report' button to get a report that shows a load flow summary and detailed load flow results at each bus. Finally, start simulation and check that it starts in steady state.